Natural calamities strike just about every part of the globe. Since time immemorial, the world has seen its fair share of disasters from time to time. However, there are certain places in the world that are more prone to these disasters than other places, and experience financial difficulties because of it. While blizzards are only experienced in places with snow and hurricanes are more common in tropical areas, earthquakes are also common in certain parts of the globe. Known as the “ring of fire” or the circum-Pacific belt, this is a region in Asia that is hit by 90% of the earthquakes happening around the world. An earthquake is a destructive earth movement whose magnitude is ranked on a scale of one to ten. When the epicenter is in the ocean, an earthquake can generate massive tsunamis that can kill hundreds to thousands of people over a short period of time. The reason that South East Asia experiences earthquakes more often than the rest of the world is because of tectonic plates making up the ring of fire. The two main plates are the Eurasian Plate and the Philippine Plate that often rubs each other resulting to powerful quakes. Meanwhile, the North America Plate and the Pacific Plate makes up the ring of fire. 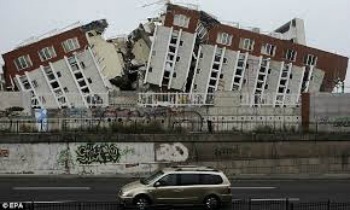 Millions die each year because of plate movements that can topple down big buildings and generate tall and powerful tsunamis that can wipe out everything on land. Asia’s cities are undergoing rapid growth – growth that will ultimately transform how cities are developed, built, and governed. While urbanisation can drive prosperity, the current rapid and uncontrolled growth of cities in Asia’s emerging economies has often undermined quality of life and exacerbated inequalities and vulnerabilities. One of the greatest risks faced by many of the region’s urban centres is the growing vulnerability to natural hazards ranging from storms, flooding and landslides to earthquakes. Climate change will further increase risks in coastal cities associated with sea-level rise, hurricanes and storm surges, while inland cities across parts of Central and South Asia are facing increased periods of heat and drought . An OECD study estimates that “climate change combined with rapid population increases, economic growth and land subsidence could lead to a more than 9-fold increase in the global risk of floods in large port cities between now and 2050.” Taking into account existing coastal protection, the study ranks cities most at risk today. Included in its ranking are Asia’s major manufacturing, logistics, and financial hubs such as Guangzhou, Shenzhen, Nagoya, and Mumbai. Rapid urbanization is seen everywhere. It is not just a common sight in progressive first-world countries but even in developing ones. Asia is the most populated continent on the planet. The casualties will be high in the event of a strong disaster hitting many of its populous urban cities. The 6.7 magnitude quake struck near the island of Mindanao in the Philippines, the US Geological Survey reported. It occurred at a depth of 10 km about 13km east of the city of Surigao, the USGS said. Although early indications state there is no major damage, the tremor will spark fears of people injured. The Pacific Tsunami Warning Center of the US National Oceanic and Atmospheric Administration said on its website there was no tsunami threat from the earthquake. Tremors from the quake were reportedly felt in a number of nearby areas, including the Philippines’ second city, Cebu City. Today’s earthquake comes just weeks after a 7.7-magnitude tremor rocked the country. Since directly lying on top of an active fault line, the Philippine capital of Manila has been implementing stricter and regular earthquake drills as well as inspections of at-risk buildings and structures to prepare everyone for the possible coming of the “Big One” that has long been overdue. Other Asian nations have also been preparing for it as earthquakes have been occurring more often than it did in the past. At least 413 people have been killed in Ecuador’s biggest earthquake in decades as a 7.8 magnitude quake struck off the Pacific coast on Saturday and was felt around the Andean nation of 16 million people, causing panic as far away as the highland capital Quito. Vice President Jorge Glas said as well as leaving hundreds dead, more than 2,500 people were injured. The latest quake follows devastating tremors in Japan late last week when one, measuring 7.3 on the Richter scale, injured more than 1,000 trapping people in collapsed buildings only a day after a quake killed nine people in the same region. Rescue crews searched for survivors of a magnitude 7.3 earthquake that struck Japan‘s Kyushu Island, the same region rattled by a 6.2 quake two days earlier. Asians live with the constant threat of disasters and earthquake is one of the most common calamities they face aside from powerful hurricanes and flooding. Over the past few decades, more and more earthquakes frequently strike various parts of Asia. And as such, many governments have increased their efforts in disaster preparedness to minimize loss of lives and damage to properties. Our achievements pale in comparison to the wrath of Mother of Nature. We only realize how insignificant we are to this world in the face of calamities that can wipe out everything we have accomplished over the past decades and centuries. And we are partly to blame why these catastrophes are happening to us. Natural calamities are a normal part of life but our abuse and misuse of natural resources resulted to the hastening of climate change that in turn worsened global warming and a list of other destructive calamities we have to face in our daily lives.